The Occupy Gezi movement, an environmental protest turned human rights activist movement, has spawned a wave of creative production. Protest art in Turkey, has ranged from graphics, graffiti, memes, videos, billboards, and other forms of creative output that commemorate and promote civil disobedience and manifestations. The riots, still raging in various cities throughout Turkey, have led to prolific spontaneous art, serve as a form of political messaging. Facing brutal and disproportionate police repression and media blackouts, the Turkish protestors have used creativity, humour, music and art as a form of non-violent civil disobedience. Here are a few examples which I saw on the streets of Istanbul. When the Turkish protests first erupted on the weekend of 31st May, the streets of Istanbul were filled with thousands of people standing fearlessly against tear gas, water cannons, and police violence. However, CNN Turk and other major national broadcasting channels chose not to cover the protests at its peak. Instead, what viewers saw was a documentary of penguins and a cooking show. Now, sarcastic it might be, the penguin has become a symbol of freedom of expression, combating the media repression and all the corruption that Turkey is facing. The Penguin is a reminder of how intertwined the interests of the media, corporations and the government are. 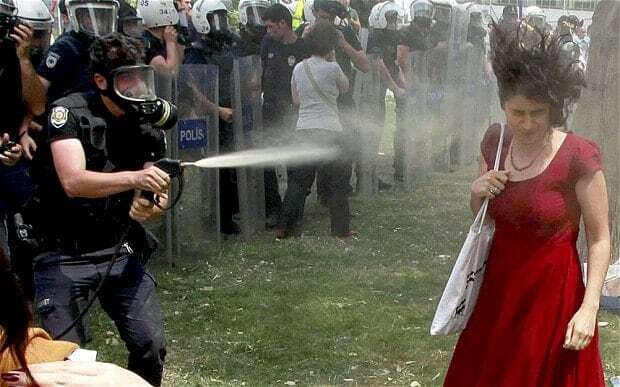 One of the more striking images of the Gezi protests is the ‘lady in the red’, a photograph of Ceyda Sungur, a young teaching assistant in Istanbul, who received a face-full of teargas at close range. She is the epitome of passive resistance; the man with a gas mask and his aggressive stance look absurd when juxtoposed with Sungur’s casual red dress and her tote bag. The photo was spread throughout social media, giving rise to graffiti, memes, graphics and billboard displays. The red dress eventually became a call for international solidarity when female MPs in the Italian Parliament showed up with red dresses at work. In one of his earlier speeches, Prime Minister Recep Tayyip Erdogan, branded the protestors as ‘capulcu’ (or looters). He has continued to show no empathy for the protestors, calling them anything from terrorists to international spies. The protestors have instead embraced this label of ‘capulcu’ as a label synonymous to ‘resistance’. A recent online poll by the Istanbul Bilgi University shows that 91.1 percent of poll participants say that the violation of democratic rights by government officials was one of the reasons why they joined the Occupy Gezi movement. Increasingly, capulcu has become a term to represent a generation of Turkish people who do not feel that they are close to any political party in Turkey. 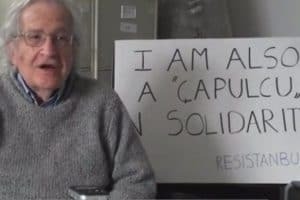 Even Noam Chomsky offered his support of the capulcu’s in Occupy Gezi, declaring ‘I am also a capulcu‘. On 3rd June, the Turkish game show ‘Kelime Oyunu’ (The World Game) managed to reference the Turkish protests close to 70 times by using words such as ‘dictator’ and ‘capulcu’. In the midst of a nation-wise media blackout, the game show was an ingenious form of civil disobedience and culture jamming. The host, Ali Ihsan Varol, used the game show to criticise the media. Translations of all 70 questions of the game show are available here: http://technosociology.org/?p=1297. Following the broadcoast, Ali Ihsan Varol reported on Twitter that the show could not be broadcasted on the following day. Another example of passive resistance – On 18th June, a Turkish choreographer and artist, Erdem Gunduz, stood alone in Taksim Square for several hours. Even while police searched his backpack and body, Gunduz remained still. This ‘endurance art’ quickly caught on throughout Turkey, with the Twitter hashtag #duranadam (standing man) organising standing protests in various cities. 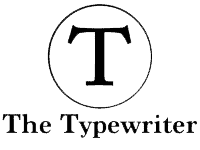 At a specific time, people stood still with their hands in pockets in shopping malls and other public venues. This silent demonstration was a direct challenge to the violent government reaction. As more people began to join Erdem Gunduz in Taksim that night, the police came and arrested Gunduz and the other protestors standing peacefully in Taksim. The expression of ideas can be in many forms, some people protest with passion on the streets whilst others might spread the word through blogs, social media, solidarity movements and even through art. What happened in Turkey never seemed to be a mere call against bulldozing a park for a shopping mall. It was a call for a return to more democratic way of governance. It was a call for the freedom of expression of political ideas. Even though when the government could temporarily prevent protestors gathering on the streets, other forms of expression – including art – still live on.